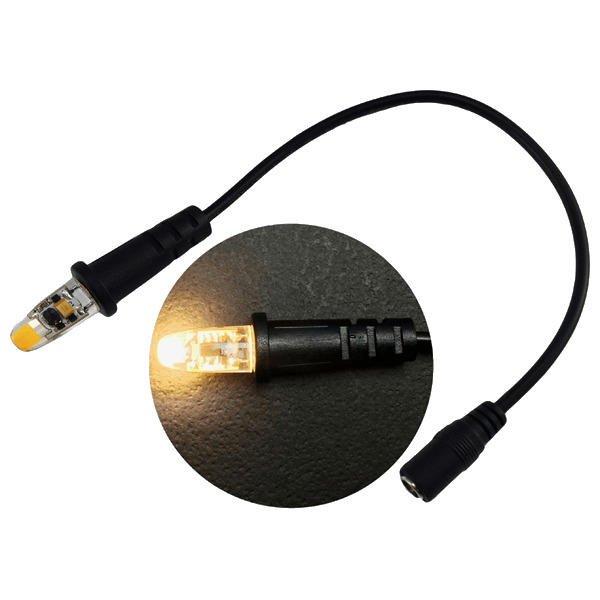 The FEL (Flame Effects Light) is a component level 8 LED Bi-Pin light with a small size and high level of flame spectrum light output. 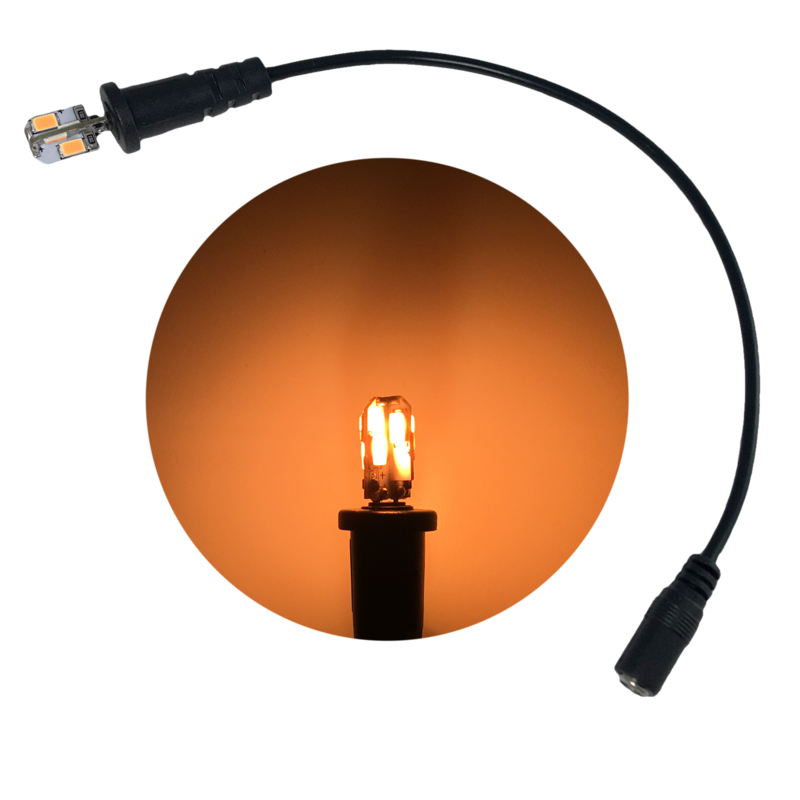 The FEL is used for themed entertainment projects for replica oil lamps, gas lamps, torches and other applications needing a warm color temperature flame source lighting appearance. 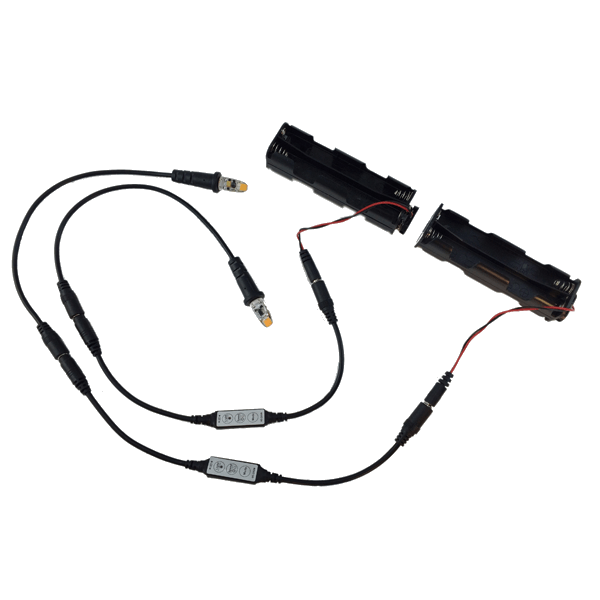 The FEL is joined with an EEL cable socket that utilizes a 5.5mm x 2.1mm DC barrel connector. The overall length of the FEL light and the EEL cable socket is 11 inches nominal. The FEL light is made with a printed circuit board structure that has 2 LEDs in each of four 90-degree quadrants, 8 LEDs total. The light output of the FEL is a very warm 1,775 Kelvin color temperature. 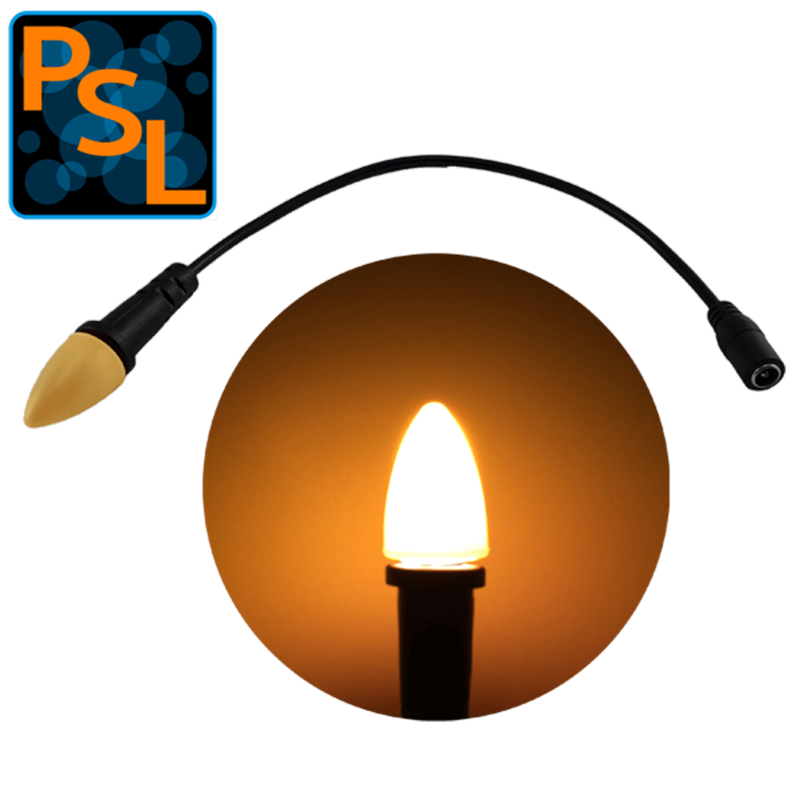 The light is a broad-spectrum flame spectrum replicating with a high 93 CRI (color rendering index). 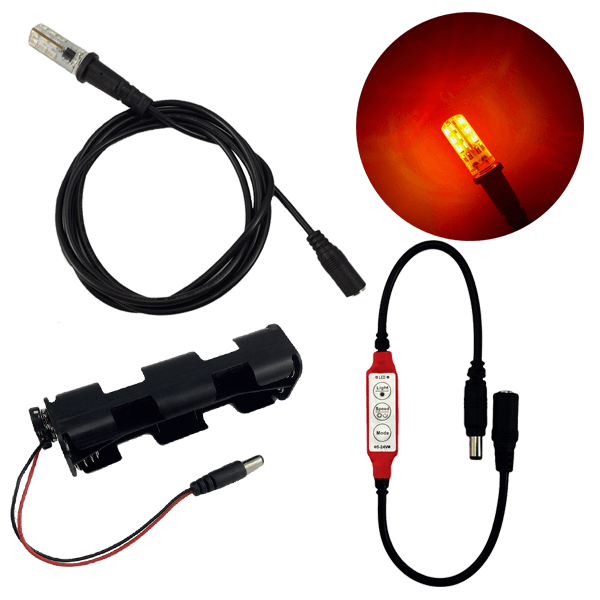 When powered at 9 volts, the FEL has a nominal light output of 22 lumens. The FEL has a nominal width of 0.44 inches and a nominal height of 0.7 inches from the socket top flange seating plane. The FEL is optimized for operating at 9 volts DC continuous. The maximum continuous operating voltage is 10.5 volts DC. 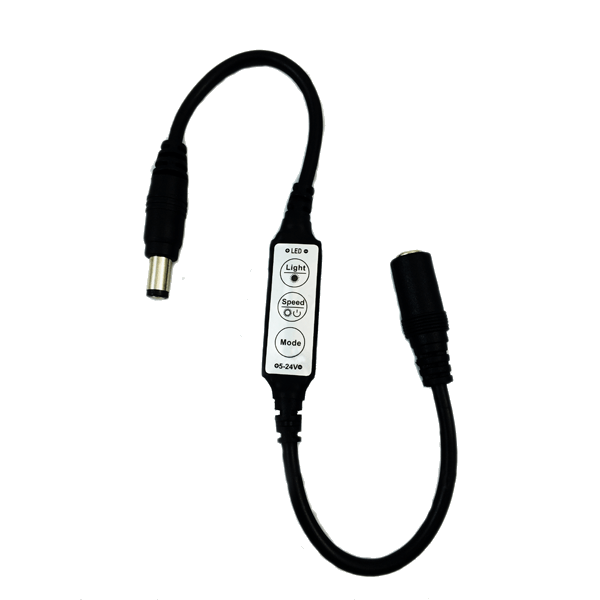 The FEL may be operated at 12 volts DC along with the FEC1 flicker effects control which reduces the average voltage to the light. The FEL light when combined with the FEC1 flicker effects control can be dimmed by varying the system voltage in the 7 to 12 volts DC range. The recommended continuous operating voltage range is 7 to 10.5 volts DC. 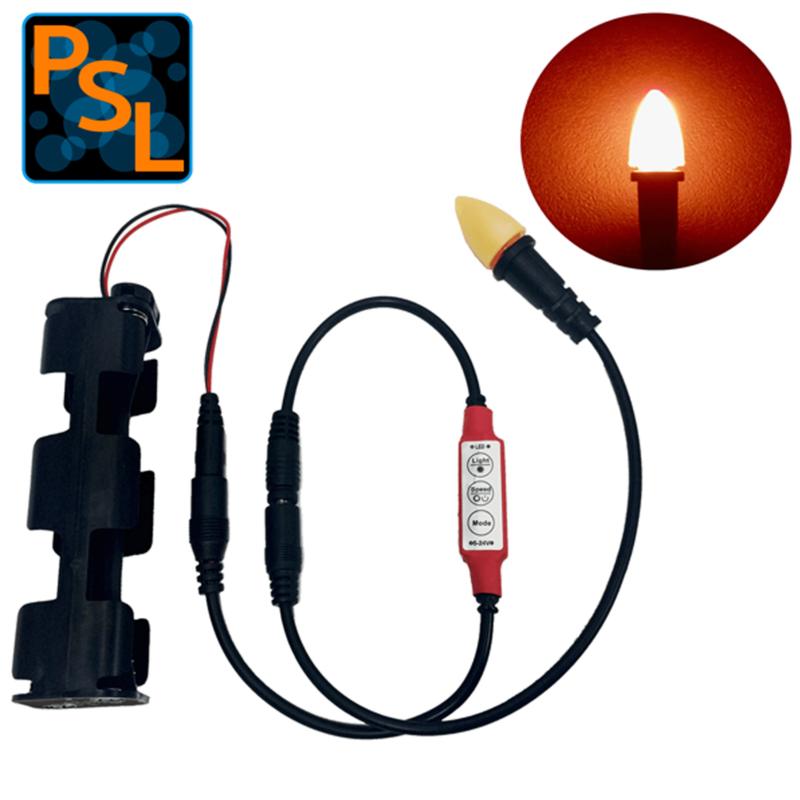 The small size and high output of the FEL allows theatrical property masters to build 9V battery operated hand held candles, torches, oil lamps etc. 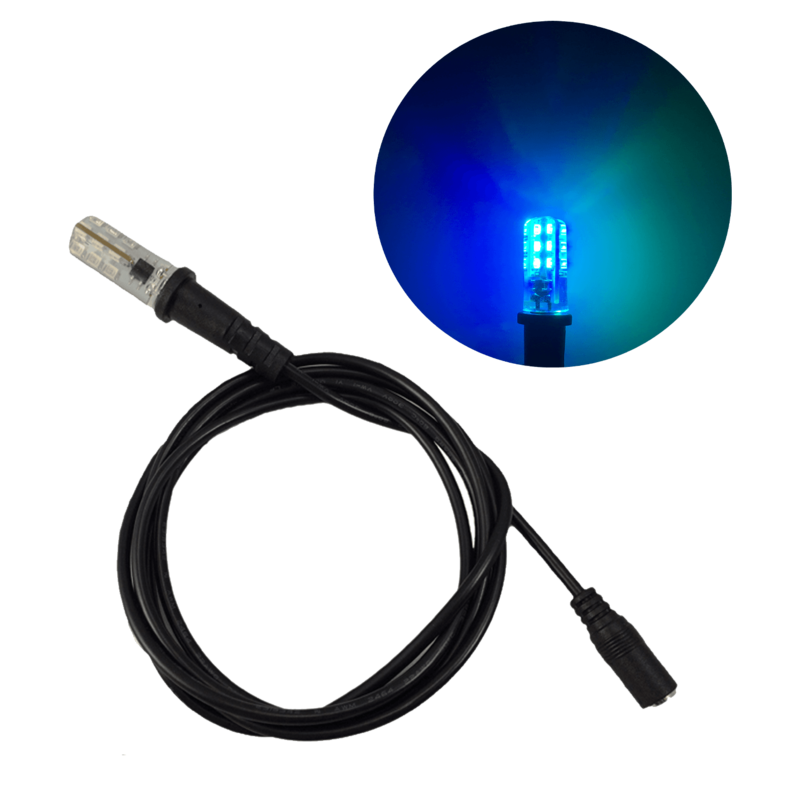 The ability of the FEL to also operate at 12 volts DC along with the FEC1 flicker effects control allows the same matching light source to be used in other scenery applications such as gas lamps or wall torches. Any candle flame shaped domes or other material used over the FEL light should not be in contact with the bulb circuit board. An air gap is recommended to allow proper cooling of the light source. An exception would be to embed the light into a clear silicone resin. The resins should be of the platinum catalyst cure type which are materials familiar to those skilled in the art of prop building and available from Smooth-On, Inc., and others manufactures. The use of catalyst cure silicone resin does not strain the components on the circuit board and is able to withstand the heat of the FEL light, has a good flammability resistance, and tends to conduct heat out the circuit board structure. The Bi-Pin socket of the EEL cable has a tapered design that can be press fit into rigid foam, wood, soft plastics and other prop building materials. The socket requires a 7/16” diameter hole, (see the specification sheet for details.) 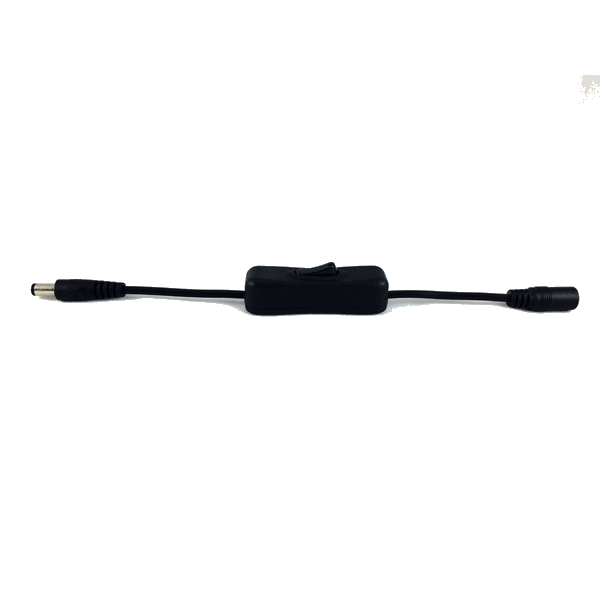 The DC barrel connector on the end of the cable is smaller than 7/16” and can be passed through the hole used to mount the cable socket. The socket has a flange on the top to limit the insertion depth into the material. For connecting a 9-volt battery see the listing for the BCC1-9V. This clip has a mating male plug 2.1mm x 5.5mm for the EEL cable socket. 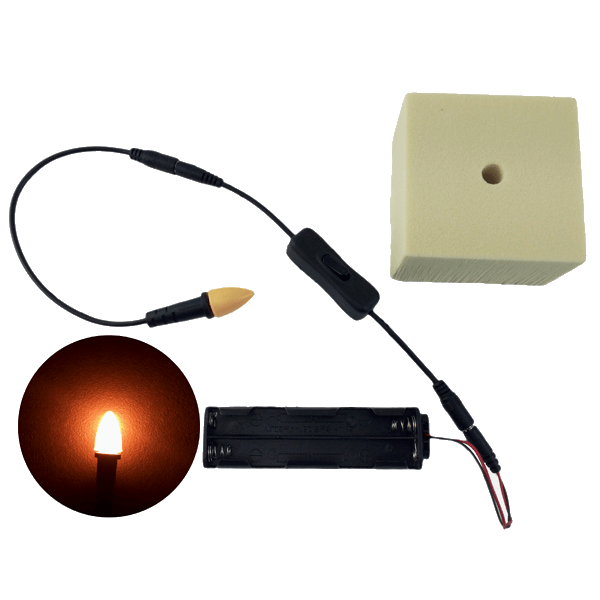 For adding flicker flame effects see the FEC1 listing. The FEC1 provides 6 different flicker modes and 10 flicker speeds.